Wherever this unorthodox quartet is performing, it leaves behind an inspired and astonished audience. 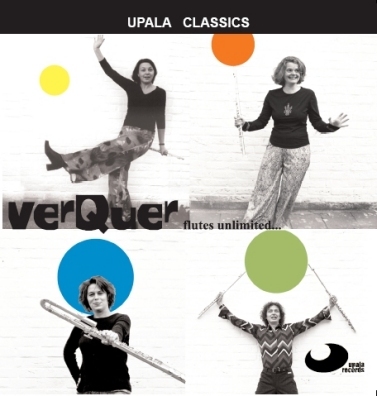 Since the foundation in 1999, VerQuer has been showing, how diverse and exciting the play on traverseflute can be. The repertoire of VerQuer is as versatile as the musicians themselves. On bass-, alto-, concert-, and piccolo-flute they spell impressing timbres and effects. Always looking for new possibilities of expressing music, own arrangements developed. 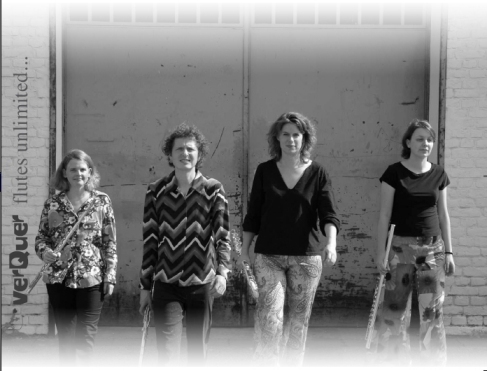 A further artistic desire of the quartet is the extension of the contemporary flute repertoire. Therefore they performed the première of "The Priest and the Macician" by Günther Zabernigg (A) in 2002, and the première of "Silent Movie" by Benedikt Brydern (USA) in 2004. Lives in Wiesbaden, studied at Wiesbadener Musikakademie and at Hochschule für Musik Detmold, Music-Kinesiology-practitioner, freelance musician, different projects in chambermusic like classical- and Avantgarde-Music. Lives at Bergstrasse, studied classical and Jazzflute at Johannes-Gutenberg-Univesität Mainz, scholarship from Berklee College of Music, Boston, freelance musician, plays in different jazzbands. Lives in Krefeld, studied at Folkwanghochschule Essen, played in different orchestras, various own projects in styles like Jazz, World-, and Avantgarde-Music. Lives in Dortmund, studied at Hochschule für Musik Detmold, projects in chambermusic, CD-productions with preference in contemporary music, toured through Asia and South-America.